- 25 Apr 2017 - updated "motor and prop sizing calculator" link below from http://adamone.rchomepage.com/calc_motor.htm (broken) to http://rcplanes.000webhostapp.com/calc_motor.htm (new). 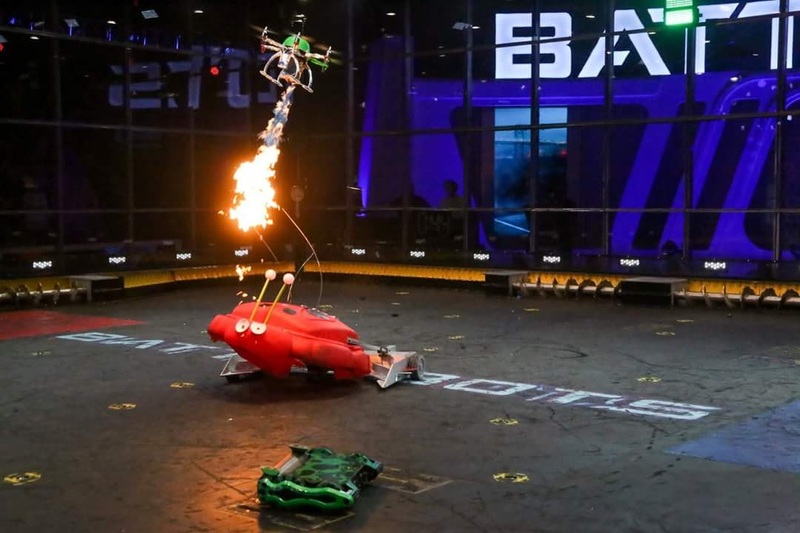 - 11 June 2016 - updated article intro below, and added the big Battlebots photo below, since BattleBots just posted it a few days ago. Also added team photo & link to buy our T-shirts on the BattleBots store. 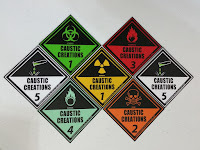 I'm the creator of a fire-shooting flame-throwing battle drone (multi-copter), "Buzz," who is an air robot hexacopter companion to our ground bot killing machine, Poison Arrow, of Team Caustic Creations (see our team Facebook page here), on ABC's BattleBots Season 2 (see our BattleBots page here, buy our T-Shirts to support us here), which will air on ABC starting 23 June 2016. I'm just one of 5 members on our team. Our main bot is "Poison Arrow." Read below for some crazy-cool fire-shooting drone previews and build drama of Buzz, as well as team & bot interviews made by our sponsor, Arrow.com, showing and discussing both robots. Build drama: why's fire gotta be so complicated!? So, from ~17 Feb. 2016 to 14 April 2016, I worked frantically to get my fire drone, "Buzz," built from scratch and working in time for the BattleBots Season 2 competition, which was filmed in Los Angeles, CA from 15-25 April. It was very very frantic indeed. It was a very difficult project it turned out, and took me approx. 300 hrs before going to the event, in addition to another 100 hrs or so spent working on the vehicle, writing more code, and competing at the event. It also just so happened to be my first ever multi-rotor I put together from scratch (but don't worry, I've been using them for years and I have a lot of background research experience with them). Zach Goff, our team captain, worked with me to size the vehicle too. Putting our experience and skills together for that part was very helpful, as was this motor and prop sizing calculator here. I meticulously wrote a couple thousand lines of C++ code (some of which I started years ago, before I had the skills to complete it) running on the vehicle in order to give me greater control over it, for future additions and work which I hope to implement later in order to add more autonomy, hopefully for Season 3 next year. While at the event, in my frantic last-minute coding, I was even able to get a serial BlueTooth device working on the vehicle, and I implemented a custom command-line interface, from scratch, to configure parameters on-board the vehicle using my Android smart phone. I was pretty excited about that! :). So, without further adieu, here's the result of my hard work. This is a GIF I created from a teaser trailer that ABC made for their show. This was pulled from their teaser trailer here, at approximately 1:40. The teaser is pretty awesome; you should watch it! As you can see, the vehicle is shooting fire. That....it turns out, was pretty stinking hard. Of my 300 hrs spent on the vehicle prior to the event (I actually logged 288.5 hrs in my project spreadsheet, but who's counting), probably *half* of that was spent just on the flamethrower. I ran into *many* problems, and each was hard to overcome. It turns out making things burn isn't as easy as one might think...especially when you need it all to be remote-controlled (RC). I had to build custom circuits, write lots of code, do some fancy programming in my Tx running OpenTx, and play with lots of hardware. Needless to say, however, I learned a *lot*...and also ruined, burned up, and destroyed some parts along the way.